The following are guidelines to follow when creating a character rig in Harmony if you plan to export it for use in Unity. When rigging and animating game sprites, you need to keep in mind the size of the exported sprite sheets as well as the resources required to play out their animations. If you are working on a console or PC game, you have a lot of leeway for both, as they often have high performance video cards and a lot of storage space. If you are working on a mobile game, you might need to take measures to ensure your animation and sprite sheets are lightweight, as mobile devices have slower rendering hardware and more limited storage space. Also, some users may want to download your game over a mobile data network with costly data charges. Each body part of the character that you want to animate independently is on its own drawing layer. Each drawing layer has its own parent peg, which should be used for animating the layer. Pegs can be rigged in a hierarchy to make body parts attached to each other move together. For example, a hand's peg can be rigged under the forearm's peg, and the forearm's peg under the arm's peg, etc. You can create groups to keep your rig structure tidy and organized. By rigging the peg of the child part under the peg of the parent part. For example, you could rig the forearm's parent peg to be the child of the bicep's parent peg. Moving the bicep's peg would automatically move the forearm. By rigging both parts under a common peg. For example, you could rig the forearm and the bicep's parents pegs under a dedicated peg for the whole arm. You could hence move the bicep's peg independently, or move the arm peg to move both the bicep and the forearm together. Nudging layers on the z-Axis to change the order in which they appear is supported and its effect will be visible in Unity. However, you should not attempt to put layers at significant distances from each other on the z-Axis in Harmony, as they will not be rendered in perspective in Unity. By default, pegs use 3D Path functions to record their position. It is recommended, but not required, to configure your pegs to use Separate position functions instead, as 3D Path functions are a bit heavier on performance. 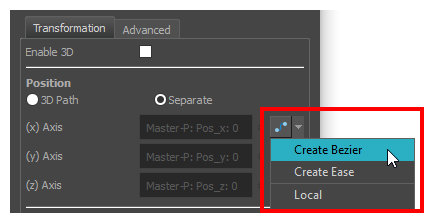 You can make a peg use separate functions by opening its Layer properties, then selecting Separate under the Position section. NOTEConverting a peg or layer's function type to Separate will discard any existing animation on that peg or layer. Open the Layer Properties view, then select the peg layer in the Timeline view. In the Timeline view, double-click on the peg layer, but not inside its name, to open its Layer Properties dialog. 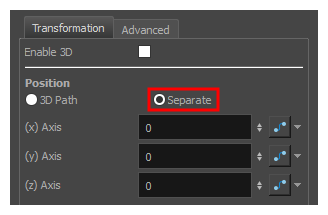 In the Transformation tab of the peg's Layer Properties, under Position, select Separate. Also, you should only animate using Bezier type functions. This is the default type of function that Harmony creates when you animate a peg or a layer. 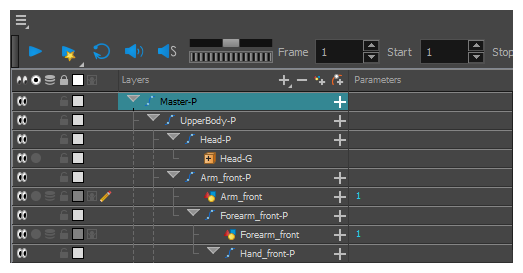 However, some animators or rig artists may have the habit of manually configuring their layers and pegs to use Ease functions instead. Exporting animation that uses Ease type functions to Unity is not supported, so you should not do that when creating a game asset. Right of one of the Position functions, click on the Function button to open its Function editor. If the title of the dialog is Bezier Editor, then the function is a Bezier function. If the title of the dialog is Ease Editor, click on Close. Then, click on the Menu button next to the Function button and select Create Bezier to create a Bezier function instead. Repeat for each of the functions in the Transformation tab. Aside from the Cutter, you should not use any effect, as no other effect supported by Harmony can be exported to Unity. This includes Colour-Override and other simple colour effects. No such effect will be exported to Unity. 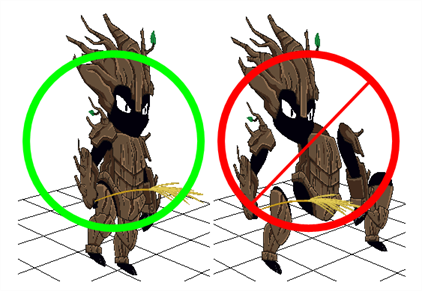 The Cutter effect also has limitations when rigging a character for gaming—see Guidelines for using the Cutter Effect for Game Assets in Harmony. Symbols The use of symbols is not supported. Only the artwork in the Line Art and Colour Art layers will be exported to Unity. By default, those are the only two art layers available. However, if you enabled the Support Overlay and Underlay Arts preferences, which is available in the Advanced tab of the Preferences dialog, you can use the Overlay and Underlay Art layers as reference or sketch layers. They will be visible in Harmony, but they will not be exported in your sprite sheets.